Oak Farm is a small livestock farm of about 26ha owned by Tony Austin. The farm appears on a map dated 1528, one of only two such maps that exist in Oxfordshire and possibly the earliest map of agricultural activity in the Chilterns. When Tony came into the farm the land, hedgerows and trees had seriously deteriorated, and he determined to restore the farm field landscape as far as possible to that shown on the 1528 map. 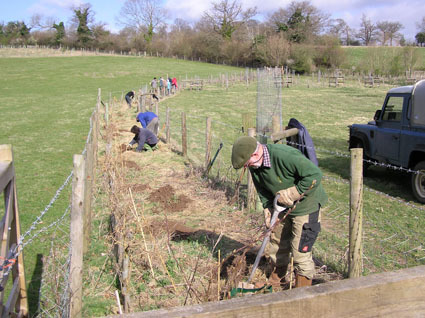 He also wished to manage the grazed area and woodland in a non-intensive way so that a wide range of indigenous plants and animals could flourish. 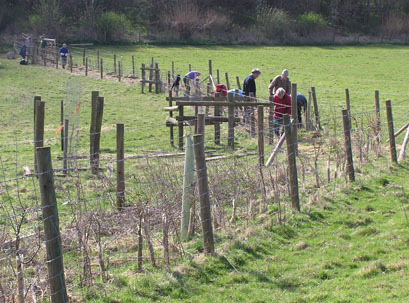 The Green Gym and other voluntary organisations have been helping in this long-term project with hedgerow planting, the preparation of hedges for laying and clearance of dead wood. The track to Oak Farm leads from the Sonning Common to Harpsden road at Hunt’s Green – follow the Green Gym signs to the parking place, which varies according to where we’re working.